What is Flowering Tea Aka Blooming Tea? 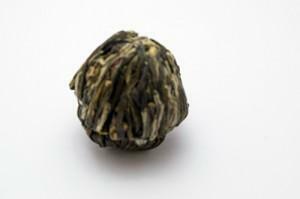 Flowering tea or blooming tea (工艺花茶) is the new kid on the block, having been emerged sometime in the 90s. 花形工艺茶is literally translated as ‘flower shaped crafted tea” which is in a nutshell what this tea is. To be more specific, these are tea leaves bundled with various flowers by hand into a compressed shape which when infused will open up to resemble a flower in bloom. This is why this is also known as blooming tea. In recent years, this has grown increasingly popular in China and abroad and production has increased accordingly. The 3 most popular production areas are Huangshan County in Anhui, Fuding County in Fujian and in recent years, parts of Yunnan province. In Fuding, the base is usually made from Silver Needles while in Huangshan and Yunnan, buds from baked green tea is usually the base. Buds are picked to provide the sweet taste as well as higher aesthetic value. In order to enhance the appearance of the tea, the Fuding Dabaicha and Huangshan Dayezhong provide a sturdier, ‘fatter’ bud, making it an ideal choice. Flowers are selected based on their aesthetic as well as Traditional Chinese Medicine properties. Commonly selected flowers include jasmine, chrysanthemum, Globe Amaranth, lily among others. Higher grade of flowering teas are scented as well to provide an even more ostensible and lasting scent to delight the drinker. How to brew flowering tea? Generally speaking, flowering tea is as much a visual enjoyment as it is a gastronomic one, hence it would make little sense not to place it in a transparent vessel. Either a glass or a glass teapot would be ideal but naturally it should be heat resistant and big enough for the tea to bloom to its full potential. In the photo I used a 500 cc teapot but I filled to about 70%. 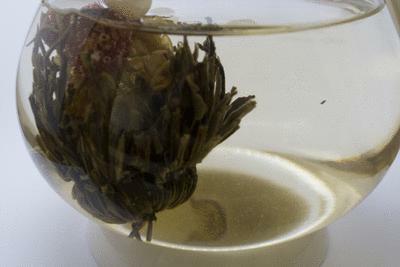 Flowering teas can usually be infused 4-5 times. These teas can also be used for decorative purposes and can be displayed up to a week. Simply change the water daily to maintain the clarity of the liquor. When is it suitable for? Due to their handcrafted nature and large serving size- each ball can range from 5 to 10g- they can be rather pricey as a daily drink. Personally I find it more suited for having friends over as a ‘starter drink’, a refreshing drink to cool down and delight in the aesthetics before moving on to other types of teas as compared to a daily drink.